I mean....or determine the feasibility/cost to return gun to its original P7M13 state? I think that would add salt to the wound to put money into to something that would be valued less than what I paid for it. However it might be my only option. It looks like you got one of the long slides that was done in Germany. I'm not sure what legit means, but it doesn't look like a Bruce Gray long slide version. I believe those are the more collectible ones. I don't think any of them had full length barrels in them. I just wonder if that M10 stayed in Germany or if it made it over here too. I agree it was done in Germany. It might be of value to actually go back and read the first few pages of this thread, nothing has changed since then. It's still against the law in Germany and worth a gunsmith's license to work on a slide like this and not have it re-proofed. That is the main argument for it being factory, is that it does not have this. Don't get caught up in Sterling VA vs. No Sterling VA on the slide, people should realize by now that all such marks are applied to slide at time of production of the slide before it ever gets near the rest of the gun and that not all such builds wind up in the USA. Old news. HK uses whatever parts it wants, I have been importing for close to 10 years now and I have seen this over and over, on P9 series as well as P7. Is it nice and pretty? No. But that thing fu**ing shoots I promise you. Have you even taken it to the range yet? P7's are accurate as shite to begin with, now give it another inch of sight radius and a very effective 2 port comp/muzzle weight. I was banging an 8.5x11" sheet of paper rapid (and I do mean rapid) at 25m full magazine and all hits were in the inner 2/3's of the paper. And that's .40 cal. The slide work on this one is identical to the 2 I imported and sold. Regular length barrel. How else to get that "comp" effect? ShaunB Try not to listen too much to folks that don't actually know, but are willing to speculate all day. "maybe", I don't think" etc.. Here's solid facts for you. 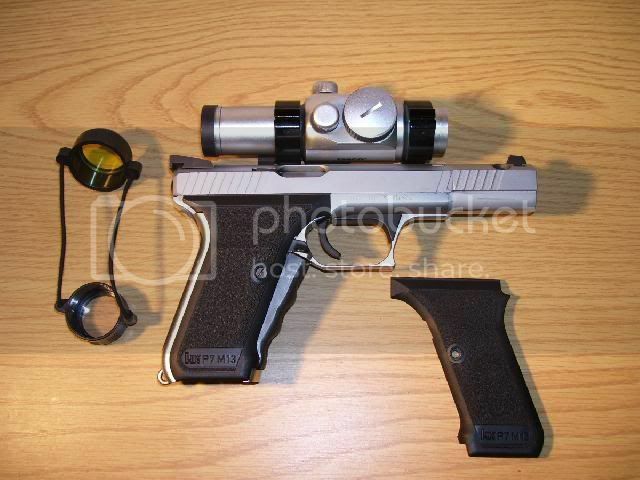 1) The 9mm I brought in, sold for about what you paid for yours. 3) The work on that gun was done in Germany. Period. I'm going to repeat myself for the purpose of emphasis, the slide work on that gun is IDENTICAL to the 2 I imported, and another one in Germany I know of. Factory or someone else has never been established past the fact that unless it is factory, someone put their livelihood in a country where it is not easy to make money in the gun business, at risk. Go try and get a licensed German gunsmith to do that. There you go, at least you didn't get taken ShaunB. The only thing I could see doing is cleaning it up a bit, smoothing out the machining marks and have it refinished. It's definitely far from a lost cause or lost money. Nothing else, tell your brother to enjoy it. Fords Guns in Fla. has the skill to clean it up and refinish it. Lamont and AGG like this. Is it at all possible this gun might legit ? Same sidearm, and poster "banned"!!! Thanks Lamont, I did read this post several times which is why I responded here. I was hoping there might be some similarities to the ones you posted and this one. Did you sell the 9mm on gunbroker or to someone in person ? It would be nice to print off that listing and keep it in the safe so 10 years from now I will remember what we are discussing today. The serial number on the pistol I bought is over 90k that concernced me as the FAQ thread said they only went up to 90k. Last edited by ShaunB; 03-19-2019 at 02:49 PM. Yes, I saw that he has same user name on forum as photobucket. I do not think he was a previous owner though was just a fan of the custom race guns. posted in 2010 but who knows where he found the photos because he also uses photos from Bruce Gray's Longslide thread. You think they would be able to clean up the tooling marks on the slide ? Such a HUGE relief ! I was still able to joke with my brother and tell him it will be the last time I ever try to do something nice for him !